The Indian Internet space is in a time of flux right, but the appeal of social networking services continues to rise in the country. New data from comScore reveals that its citizens spend one in four minutes online using social networking sites, more than any other Internet activity. According to comScore, social networking’s share of the total number of online minutes in India in June rose 0.8 percentage points year over year to 25.2 percent. It was the second-fastest growing activity, behind only entertainment. 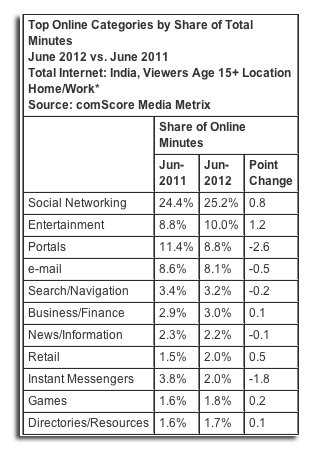 During the period, entertainment took up 10 percent of online minutes, up from 8.8 percent in June 2011. Portals and email were the third- and fourth-most popular activities with 8.8 and 8.1 percent, respectively. However, the analysis covers just home and work PC Internet users and excludes public access computers, mobile devices and Internet cafes. Considering that mobile connections are expected to eclipse PC access in India this year, comScore’s metrics are taking in a shrinking percentage of overall usage. 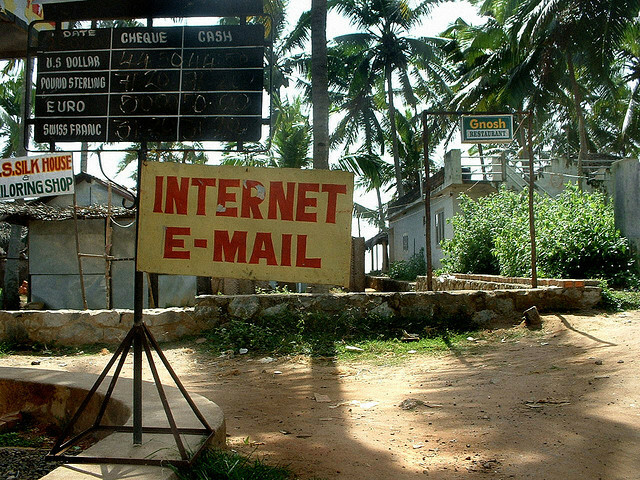 All told, there were an estimated 61 million unique Internet users in India in June. That’s up from an earlier calculation of 56 million visitors in the first quarter of 2012 by comScore. Facebook looked to be leading social service with an estimated 224.9 average minutes per visitor in June and 83.4 percent penetration in the Indian market. The site also achieved roughly 51 million unique visitors from the country. Google’s Web properties had the highest reach of any other company with 94.8 percent penetration. With an average of 155.3 minutes per visitor, users didn’t spend as much time on the company’s sites as they did on Facebook, though. Yahoo!, Microsoft and Wikimedia rounded out the top five, according to the firm. An earlier report from comScore pegged India as the third-largest online video market in Asia during the month of June, with a total of 45 million unique visitors and a 73 percent reach of the country’s Web population.